I am on my every other year sojourn on Kauai staying in timeshare luxury, swimming alone in the huge torus shaped pool each morning, visiting the sacred sites of Kalalau Valley overlook, various heiaus and the sacred site of beauty in every ocean wave , changing cloud and wise sentient mountain overlooking the green creation with splashes of red orange. I’ve come, nearly escaping the GOP convention, leaving to the background the violent summer, focusing on the here and how decisions of when to swim,, sleep and meditate . i seek healing and rejuvenation. What I’ve found is the Sisterhood. First a minister who heard about me from a friend who had built a labyrinth in the South East quadrant of Kauai, took me to dinner and now we are plotting a Dream Quest in Kauai Our stories fit together like puzzle pieces and we enjoyed each other’s take on our world and the hows of communication across cultures. Next came the wonderful Sisters of Auntie Angeline’s massage haven. Two lovely women–Jen and Ann– sang into my ears and then massaged with such loving care, that I drifted into a sweet surrendered reverie. Ann, noticing my Chalice Well ring, wished me a Happy Llamas. We hugged goodbye with, smiles of recognition of sisterhood . It struck me that these women whom I had never met were reciprocating some gift I have given and will give again. I have no doubt that we all knew it. Yesterday, I visited Lawai International Center near Koloa, greeted by Eve and Mary Anne, volunteer guardians. This ancient site has been renewed in this time. Originally it was it the site of a heiau in the shape of a turtle overlooking the flow of the the Lawai River. Ancient lava stones create a wall and mounded earth are the Turtle’s head and body. 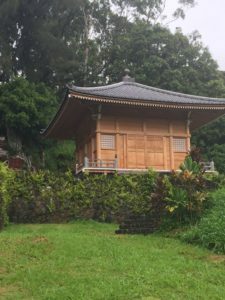 At the time of the Japanese migration to the island in the 19th century, Japanese field workers asked if they could use the site to honor their ancestors and were graciously welcomed. Over the years they built 80 shrines housing homemade carvings of Buddhas and other deities, honoring the ancestors. With the changing fortunes of the islands and different waves of migration, the site fell into neglect. Recently it has been awakened and a beautiful temple built on the back of the Turtle. This temple is held together without nails utilizing an ancient building technique. I was struck by the beauty of layers of spirituality. First the indigenous, then the respectful addition of the Japanese and third the grateful honoring of the whole in an ecumenical practice of tending and pilgrimage. Each shrine is beautiful kept with additions from this time of stones and crystals. In each shrine there was a tiny “vase” with fresh bit of pine.. ever green. 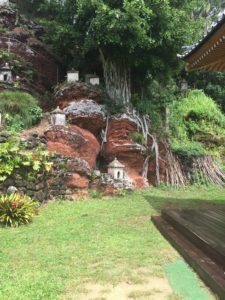 When I asked who tended the shrines, I was told that the local librarian came each week and cleaned each shrine, adding the greenery when necessary. Later that day, I stopped by the library and thanked him. He was surprised and a little wary, but then said his contribution was so small…. and still I thanked him, struck by the invisible work, so often done by the Sisterhood and so seldom honored was this dear man’s calling. 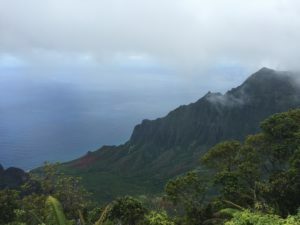 Another link with the Sisterhood came at Kalalau Valley overlook, a place that has called me for over 20 years. High up in Waimea canyon, this spot always makes me want to fly. I found myself standing next to a native Hawaiian, there showing her granddaughter the site. I asked her what she knew about the valley. She told me that it had been inhabited since the 13th century–just the time that Chartres was built. It was because of sugar production interrupting the water supply the native population was forced to leave in 1922. About that time anthropologists from the Smithsonian came to exhume bones in order to study the indigenous people. At my horrified expression, she told me that the bones had been returned only recently and that she had been part of the ceremony of returning the bones to the land. I asked her name. Auntie Leia, she said and beamed. She then told me a story about coming to the overlook on a very misty day with a relative. They were disappointed not to see the vista and stepped away from the edge to pray for a break in the mist. Out of the mist, a giant fist appeared clearing a bit of the fog and landing at their feet. She said that the blessing of that mist filled her whole soul. The dew is very powerful here she said, twinkling. We embraced and I went on to be with the gathering mists and pay homage to this generous place. 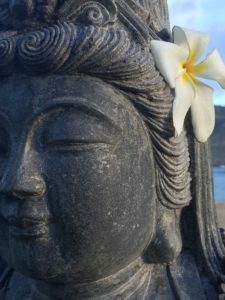 The spirit of Aloha is an invisible and quiet gift, like the Sisterhood. This entry was posted in Uncategorized on July 21, 2016 by Judith.